A survey released today by the Commonwealth Fund ranks the United States dead last in the quality of its healthcare system compared to ten other developed nations. At the same time, it's also the most expensive in the world. Frustratingly, the new report (pdf) shows that the U.S. is not improving; it ranks last, just like it did in the 2010, 2007, 2006, and 2004 editions of the survey. Call it a ten-year losing streak. Other nations evaluated in the survey included Australia, Canada, France, Germany, the Netherlands, New Zealand, Norway, Sweden, Switzerland, and the United Kingdom. The U.K., which spends just $3,405 per person on health care, ranked first overall among the 11 nations. Compare that to the United States' $8,508 per person. "Most troubling, the U.S. fails to achieve better health outcomes than the other countries, and as shown in the earlier editions, the U.S. is last or near last on dimensions of access, efficiency, and equity," write the authors in the report's executive summary. For the survey, the Commonwealth Fund (a U.S.-based think tank), incorporated patients' and physicians' survey results on care experiences and ratings on various dimensions of care, among other metrics. Not surprisingly—given the absence of universal coverage—people in the U.S. go without needed health care because of cost more often than people do in the other countries. Americans were the most likely to say they had access problems related to cost. Patients in the U.S. have rapid access to specialized health care services; however, they are less likely to report rapid access to primary care than people in leading countries in the study. In other countries, like Canada, patients have little to no financial burden, but experience wait times for such specialized services. There is a frequent misperception that trade-offs between universal coverage and timely access to specialized services are inevitable; however, the Netherlands, U.K., and Germany provide universal coverage with low out-of-pocket costs while maintaining quick access to specialty services. That said, the authors believe that the problems inherent in the U.S. healthcare system are so pervasive that it will take more than better access and equity to solve them. According to Karen Davis, lead author of the study, overall improvement "is a matter of accountability, having information on your performance relative to your peers and being held accountable to achieving a kind of care that patients should expect to get." But it's not an intractable problem. The U.K.'s excellent result can be attributed to a number of reforms, including the hiring of more specialists, allocating bonuses to family physicians who meet quality targets, and adopting health system information that allows physicians to easily share information about their patients. Moreover, every citizen (apparently) has a doctor. the U.S. has significantly accelerated the adoption of health information technology following the enactment of the American Recovery and Reinvestment Act, and is beginning to close the gap with other countries that have led on adoption of health information technology. Significant incentives now encourage U.S. providers to utilize integrated medical records and information systems that are accessible to providers and patients. Those efforts will likely help clinicians deliver more effective and efficient care. 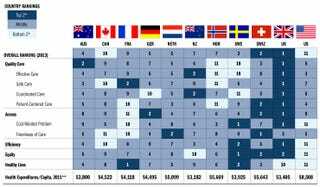 It's worth pointing out that Canada — a country much heralded for its healthcare system — finished 10th out of the 11 countries evaluated. Problems in Canada include safe care, timeliness of care, and efficiency. So like the U.S., Canada has some catching up to do — and looking to Europe may help. Moreover, Canadians need to wake up to the fact that there's more to health care than merely advocating for its universality; quality counts for a lot. More at the Commonwealth Fund.